Author and physician Deepak Chopra delivers a powerful existential speech that will leave you amazed. More and more people are “waking up” spiritually. And for most of them, the question becomes: now what? “Information about life after awakening is usually not made public,” explains Adyashanti. “It’s most often shared only between teachers and their students.” The End of Your World is his response to a growing need for direction on the spiritual path. Consider the book you hold in your hands Adyashanti’s personal welcome to “a new world, a state of oneness.”….ADYASHANTI (whose name means “primordial peace”) dares all seekers of peace and freedom to take the possibility of liberation in this life seriously. He began teaching in 1996, at the request of his Zen teacher with whom he had been studying for fourteen years. Since then, many spiritual seekers have awakened to their true nature while spending time with Adyashanti. More and more people are “waking up” spiritually. And for most of them, the question becomes: now what? “Information about life after awakening is usually not made public,” explains Adyashanti. “It’s most often shared only between teachers and their students.” The End of Your World is his response to a growing need for direction on the spiritual path. Adyashanti’s nondual teachings have been compared to those of the early Zen masters and Advaita Vedanta sages. Expressing both the infinite possibilities and the ordinary simplicity of a spiritually realized life, Adyashanti’s teachings are directed to those who are sincerely called to awaken to their true nature and embody this life-changing realization. In this video, Eckhart Tolle tells how we can remain untouched by what the life throws at us! Eckhart is a spiritual teacher and author who was born in Germany and educated at the Universities of London and Cambridge. 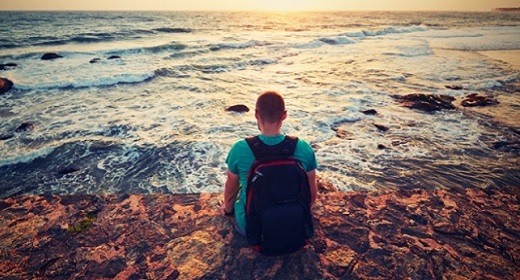 At the age of 29, a profound inner transformation radically changed the course of his life. The next few years were devoted to understanding, integrating and deepening that transformation, which marked the beginning of an intense inward journey. Later, he began to work in London with individuals and small groups as a counselor and spiritual teacher. Eckhart shares his time between British Columbia, Canada and California. Eckhart Tolle is the author of the #1 New York Times bestseller The Power of Now (translated into 33 languages) and the highly acclaimed follow-up A New Earth, which are widely regarded as two of the most influential spiritual books of our time. The most simple, powerful and underestimated success secret is our ability to concentrate. If you master your power of concentration, you can achieve success in almost anything you want! Great yogi Swami Vivekananda sharing his wisdom on the secret of success. The turning on ourselves contracts us. In those moments, we are disconnected from our inner life and from each other. We move through the day with an undercurrent of I’m not okay, but are unaware of how much it’s affecting our capacity to relax and enjoy our moments. >So, there are all of the forces at play that are completely out of our control, but we take them personally, like they are our fault. There is a stuck place, where our primitive brain and body activity—fear, aggression, craving—becomes my fear, my aggression, my craving. Rather than being universal wiring in our nervous system, we get this feeling that what we are experiencing is uniquely ours. But when these experiences of anxiety, fear, jealousy, resentment, anger, aggression and so on arise in us, if we can get even a glimmer of understanding that it’s part of the human condition—it’s not my fear, it’s the fear—that shift can create the willingness, flexibility and gentleness that makes space for very deep healing to occur. When we can say,”It’s not my fault”, it actually enables us to be more responsible and more accountable. It’s the self-blame that actually locks us into repeating the patterning. Realizing that the first arrow is out of our control and releasing self-blame is the beginning of bringing forth the awareness that can free us from the pain of the second arrow. From the mind of world-famous philosopher and humanitarian Jean Vanier comes this exploration of life’s greatest questions: Who are we? Why are we here? What is the purpose of life? 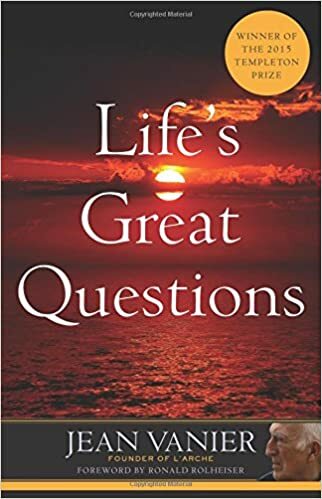 With his characteristically deep yet accessible style, the L’Arche founder encourages you to delve more deeply into your own faith and spirituality and helps you to find your own answers to life’s great questions. Jean Vanier is a philosopher, writer, religious and moral leader. In 2015 he was awarded the prestigious Templeton Prize. He is the founder of two major international community-based organizations, L’Arche, and Faith & Light, that exist for people with intellectual disabilities. The 135 L’Arche communities in 33 countries and 1,600 Faith & Light communities in 80 countries are living laboratories of human transformation. In and outside of these organizations, he has spent more than four decades as a deeply radical advocate for the poor and the weak in our society. Life without a reason, a purpose, a position… the mind is frightened of this because then “my life” is over with, and life lives itself and moves from itself in a totally different dimension. This way of living is just life moving. That’s all. As soon as the mind pulls out an agenda and decides what needs to change, that’s unreality. Life doesn’t need to decide who’s right and who’s wrong. Life doesn’t need to know the “right” way to go because it’s going there anyway. Then you start to get a hint of why the mind, in a deep sense of liberation, tends to get very quiet. It doesn’t have its job anymore. It has its usefulness, but it doesn’t have its full-time occupation of sustaining an intricately fabricated house of cards. This stillness of awareness is all there is. It’s all one. This awareness and life are one thing, one movement, one happening, in this moment — unfolding without reason, without goal, without direction. The ultimate state is ever present and always now. The only thing that makes it difficult to find that state and remain in that state is people wanting to retain their position in space and time. “I want to know where I’m going. I want to know if I’ve arrived. I want to know who to love and hate. I want to know. I don’t really want to be; I want to know. Isn’t enlightenment the ultimate state of knowing?” No. It’s the ultimate state of being. The price is knowing. This is the beautiful thing about the truth: ever-present, always here, totally free, given freely. It’s already there. That which is ever-presently awake is free, free for the “being.” But the only way that there’s total and final absolute homecoming is when the humanness presents itself with the same unconditionality. Every time a human being touches into that unconditionality, it’s such peace and fulfillment. In your humanity, there’s the natural expression of joy and love and compassion and caring and total unattachment. Those qualities instantly transmute into humanness when you touch into emptiness. Emptiness becomes love. That’s the human experience of emptiness, that source, that ever-present awakeness. For the humanness to lay itself down — your mind, your body, your hopes, your dreams, everything — to lay itself down in the same unconditional manner in which awareness is ever present, only then is there the direct experience of unity, that you and the highest truth are really one thing. It expresses itself through your humanity, through openness, through love. The divine becomes human and the human becomes divine — not in any “high and mighty” sense, but just in the sense of reality. That’s the way it is. The only price is all of our positions. The only price is that you stop paying a price. For years I struggled to find the peace I really wanted. And the to live every moment without being distracted by the past or the future. During that time, I lived with anxiety, insomnia and way too much useless thinking going on in my head. It was never easy. One of the reasons I was never truly at peace was because of one recurring problem: I couldn’t learn to “accept” where I was without wishing it were different. Because avoiding and fighting against what is happening inside you only makes it worse. Unfortunately, acceptance is also really hard to cultivate. We’re practically wired to not accept the moment if it’s not 100% comfortable. What helped me was coming across Japanese Buddhist master Miyamoto Mushashi’s 21 rules of life. 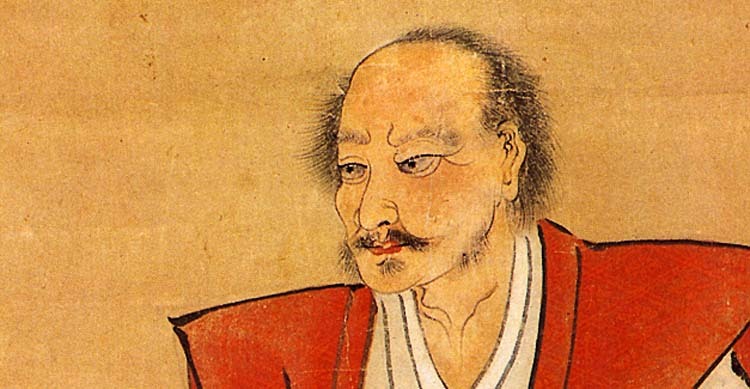 Known as Japan’s greatest ever swordsman, he wrote these 21 rules 2 weeks before his death. Each rule teaches you to accept your circumstances in life, detach from outside forces you can’t control and be comfortable with who you are. I find these rules powerful because the only way to cultivate acceptance is through continued practice in your actions and your attitude. The two things we actually have control over. And these rules give you the necessary guidelines to do just that. It might take months to rewire your brain, but it’s well worth it. Extremely hard to do. But it’s something none of us will escape. We can either learn to accept that our own and our close one’s time will eventually come, or fight against it causing anxiety and sadness for the rest of our lives. Looking to reduce stress and live a calmer, more focused life? Mindfulness is the easy way to gently let go of stress and be in the moment. It has fast become the slow way to manage the modern world – without chanting mantras or finding hours of special time to meditate. The Buddha taught that we live our lives on the tip of intention, it is the seed of our future. This talk explores the difference between “limbic” intentions driven by grasping or fear, and intentions that are the call of our awakening heart. You will learn how to identify and shift from a “limbic” to wise intention, and several different ways you can more readily and regularly access your deepest aspiration. I already respected and had personally benefited from Eckart Tolle’s teachings when my friend Jess and I sat down with Eckhart at his publisher’s home in Vancouver, British Columbia. I have interviewed a pretty fair number of impressive spiritual teachers over many years. Nonetheless, I remember being truly affected by Eckhart’s very presence. Because that’s just what it was: presence. His presence was as much a teaching as the words. What I have to offer you are just the words, I’m afraid. But I assure you: they’re good, too. Here’s an excerpt from that Vancouver interview. Learn more about Eckhart, his best-selling books The Power of Now and A New Earth, and his teachings at http://www.eckharttolle.com. Ray Hemachandra: Eckhart, why is stress so common? And what are the consequences of people living stress-based lives? Eckhart Tolle: The whole world accepts that being stressed is the normal way to live. In fact, people think you have to be stressed to be successful. They think if you are not stressed, something is wrong with you. But any action that arises out of stress is of low quality, and it contributes to human suffering. You are making yourself and others suffer. Stress is a form of suffering. Look at your body and see what stress does to the body and its functions — what it does to the heart, the circulation, the immune system, the digestive function, the liver. Stress is extremely harmful to the body. Even mainstream medicine now is recognizing how many diseases stress causes. Stress is a form of suffering, but it is accepted as normal. And it is normal in our world. But it is not natural. Ray: When people realize they are stressed, what is the best response? Eckhart Tolle: First, you can be very much aware that when you are stressed, it always is a sign you have lost the present moment. So, you can choose to re-enter the present moment. And of course you can. Then the future recedes. It becomes peripheral. You know it’s there. You need to get there, yes. But you can enjoy the present moment, and you can be aligned with the doing. A different state of consciousness, then, is the foundation for what you do. Presence flows into what you do. Even though what you do may be the same, there is a fundamental difference: The energy that flows into what you do, although it may be high energy, is very peaceful energy. It is not out of alignment with life. So, that is for people to learn: You can be effective in this world without stress. It is not necessary to do things in a state of anxiety or anguish. That is not the way to be aligned with life. Ray: How do you begin to align yourself? Eckhart: Work to recognize the primary importance of the present moment. A good little pointer toward that is to ask yourself, “What is my relationship with the present moment? How am I relating to it?” These are temporary questions, because the deepest truth is you and the present moment are one at the deepest level. These are important questions that can bring you back to realizing the now is all you ever have. There never is anything else. So, you might as well make the now your friend. Otherwise, you are out of alignment with life itself. When you live as a friend of the now, many changes come into your life. When you are not making the present moment into a means to an end, you also are not making every human being you meet — in your business and even at home, in your family — into a means to an end. That is not the way to live. Ray: So, living in the now improves the quality of all human relationships. Eckhart: Yes, of course. For example, if you are a businessperson, you meet customers in your business. Are they means to an end? If the present only is a means to an end, the people you are meeting also become part of that, because you want something from them. You want the business. You want the information they are going to give you. You want their money. Whatever you want, they become means to an end. That reduces the quality of human interactions tremendously. Human interactions become egoic, because the other people also then make you into a means to an end. When you meet another human being while living in the present moment, then the primary event is as the book A Course in Miracles describes: Whenever you meet anybody, it is a holy encounter. The primary event is the energy field of presence between you and the other human being that arises. You enjoy it. There is deep joy in the meeting. Then, whatever you want to achieve is secondary: the business, the exchange of information, whatever it may be. Yes, you do that also, but there is a deeper foundation — meeting that human being in a state of shared presence. Even if the other person is not present, it doesn’t matter. You can’t say, “Wait! For him, I only am a means to an end, so what do I do?” It doesn’t matter. You honor that moment — the only moment there is. If you honor that moment, you also honor that human being, because it is in that moment the human being appears in front of you. So, honoring the moment is honoring every human being you meet. The only place where you can meet them is in the moment. And that brings a totally different quality into human interactions. You enjoy the present moment. You enjoy the other person’s presence. The other person’s presence ultimately is the same as your presence, because it is in presence that there is true meeting. Whatever happens is secondary. In the example of a businessperson, if you get the business, fine. If you do not get the business, that’s fine, too. It seems to me those people who already live like that, because some do, are actually very much more successful than those for whom every person they meet is a means to an end. Ray: Would you give an example of such a person in the business world from your own experience? Eckhart: When I bought a car some years ago, the salesman totally was in a place of joy. I could see he didn’t care whether I bought the car or not. He was enjoying showing me the car and taking me for a test drive. And it was for me to finally say to him, “Yes, I’m taking your car.” But I know very well if I had said, “I don’t think I’ll take it,” he would have remained just the same. And, perhaps, three years from now if I buy another car, I will go back to him and buy. Let’s say you also are going to buy a car. If the salesman sees you as a means to an end, then if you don’t buy his car after he talks to you for an hour, shows you cars, and goes for test drives, he is going to be upset. So all he ever wanted from you was for you to pay your money and buy that car. He was not interested in you as a human being. He was not interested in the present moment. He was interested in the future moment. Even if they don’t know it consciously, people can feel when you are making them into a means to an end only. And people are much less likely to do what you want them to do — for example, to buy the car — when they feel you are reducing them into a means to an end. Everything flows with much greater ease when people live as one with the present moment. Then you are one with every human being you meet, and that’s the only way the world really can change. Ray: What are the global implications for such a shift? Eckhart: The world is in such a mess because of the continuous conflict that arises between human beings — not only between individuals but between tribes and nations and this group and that group and so on. But change can come in only when people start with themselves. Nations consist of individuals. It is for every individual to bring in a different quality — the quality of awakened consciousness — into their lives. Then, everything will change. When enough humans do that, the relationships between nations will change. The whole madness we still experience, which is the old consciousness, will come to an end. Ray: That brings me to two questions — one on the collective level and one on the individual level — that seem to tie together now. You have written that human beings had to develop a state of insanity, or madness, as a collective to then be able, evolutionarily, to transform and awaken. That parallels what seems to happen on the individual level, doesn’t it? As a child, a person builds up an egoic sense — the child has a name, has an “I,” has a mind. But then, to awaken, a person needs to completely transcend that sense of ego. Why was it necessary for humanity to go through insanity to get to the point now of potential awakening, and then, on an individual level, do all people really have to build up an ego just to tear it down upon awakening? Eckhart: On an individual level, you can see how the ego develops even in a small child. For example, when one child says to another, “I can do this, I bet you can’t”; “My dad has a bigger car than yours”; or, “My dad is stronger than yours.” Children identify with this or that, trying to build up a sense of self — a mentally defined sense of self. So far for humans it has been the case that ego develops and then humans are stuck with it for the rest of their lives. On the new Earth, as the awakened consciousness comes in, I would say the ego would develop in children and quickly become outgrown when they reach adulthood. So, the egoic stage will be much more short-lived, and it will be associated with growing up. When humans reach their early 20s or mid 20s, they quickly will go beyond ego. Ego is an immature stage of development for humans, and that’s what it will be recognized as when the consciousness changes on the planet. Children will develop an ego and quickly outgrow it. That’s very different from developing an ego and being stuck with it for the rest of your life. Eckhart: On the collective level, was what has happened necessary? Yes, because it happened. It happened, so it was part of the larger totality of what is. Humanity, it seems, had to go through that developmental stage. You can say it is an immature stage. Like in an individual with a mentally defined sense of self that identifies with this or that, it is not knowing who you are. Humanity had to go through it. It started with the arising of the ability to think, which I believe is described in the beginning of the Bible as the fall. It is the telling of good and evil. Suddenly, you can differentiate mentally, “This is good, and this is bad.” Humans eat of the tree of the knowledge of good and bad. Suddenly, they start cutting reality up into bits and pieces, which is what the thinking mind does. At first, it wasn’t a problem. In fact, it was an enormous step forward in the evolution of humanity. Although they were not physically stronger than many animals, quickly through thinking — which became their most powerful weapon — humans were able to outwit animals. Then, thinking grew and grew. For a long time humans probably were in touch on a deeper level with the depths of their being, unconsciously so, the same way an animal or a tree is. Gradually, though, more and more of their identity went into the movement of thought. They identified more and more with the movement of thinking. So, they got cut off from the depths of their being. Their identity moved into the head. They were defined mentally, and then they became egoic entities — me — scoped more and more separate, because the thinking man cuts reality into, “This is me, this is the other, this is us, this is them.” He cuts everything. So, the egoic entity arose. Then, after thousands of years, they were trapped in the mind. So, their greatest weapon had become their greatest trap. It’s an old mythological motif: The thing that gives you power also traps you. Ray: Why is now the time for humanity to escape the trap? Eckhart: We are in the final stages of egoic madness. Almost the whole world is fighting each other. We witnessed the final stages of egoic madness in the 20th century, and even now it still is playing itself out. It has not quite come to an end yet. Humanity had to go through egoic madness, it seems, and then outgrow it. Although that still is the predominant energy on the planet, there are now many — more and more — humans who are outgrowing that stage of development. Humanity is reaching the end of the evolutionary stage of ego. The closer we get to the end, the more dysfunctional humanity becomes. I sometimes give the example of a caterpillar metamorphosing into a butterfly. For a while, the caterpillar’s life works quite well. And then, suddenly, something goes wrong with the caterpillar. It cannot move very well anymore. It becomes more and more dysfunctional as a caterpillar just before the metamorphosis into a butterfly happens. That is what is happening to humans now. We had to go through an evolutionary stage. We are getting very close to the end of that stage. In fact, for many humans the end already has come. And, so, the dysfunction becomes more apparent. Ray: Do you see the awakening happening equally around the globe, or does it vary globally? Eckhart: It varies enormously. Some groups and individuals still are immersed totally in the egoic consciousness. Others already are free or in the process of stepping out of ego. The arising of the new consciousness already has started for many people. They are not yet recognizable as groups, but they are here and there. I come into contact with people like that all the time because of the work I do. So, I sometimes get a distorted view of how quickly humans are evolving, because I meet many people who are evolving beyond ego. Then I have to switch on the TV to realize, “Oh, no, it is not happening to everybody yet.” But it is happening. I cannot make predictions. There are many things that are still uncertain and that probably nobody knows, because so many factors determine what form the transformation of consciousness on our planet takes. For example, there is the possibility of very major upheavals — geographic, climatic upheavals. There are some indications this is happening already. They are part of the upheaval that is happening inside human beings: the shift of one state of consciousness — the breakdown of one state of consciousness — and the arising of a new state of consciousness. It is an enormous evolutionary event. It seems we are witnessing more and more catastrophic natural events on the planet: hurricanes, earthquakes, tidal waves, and so on. To me, inner and outer are so strongly linked that any collective change that happens within human beings, within the human psyche, inevitably will be reflected externally in what happens on the whole planet. So, the upheavals are reflecting the inner upheavals and the breaking down of the old egoic consciousness, which also manifests as increasing madness in what the egoically possessed humans do. There are governments and nations that still are egoically possessed. What they do becomes more and more mad. Terrorism is an example of that extreme madness. People blow themselves up just to kill others. Unconscious reaction to terrorism is equal madness. Ray: In your book A New Earth, you write, “Evolve or die.” What makes this time in human history so fertile and foreboding? Eckhart: With the egoic consciousness having become so dysfunctional, and now having at our disposal all these enormous technologies and scientific advances, if nothing changes the ego will use those things — as it already has been doing — and will amplify the technology that we now have. The scientific advances, to a large extent, will be used in the service of the ego, and they will become more and more destructive. So, the egoic madness, or dysfunction, becomes enormously amplified by the science and technology we all have developed. We would destroy ourselves and the planet now if no change happens, because of the amplification of the egoic state through science and technology. It first happened with the First World War of the 20th century. For the first time, humans had all these weapons that didn’t exist before. They had submarines. They had machine guns. They had poison gas. They had flamethrowers. Now, we have developed infinitely more sophisticated weapons of destruction, but that was the first time it happened. The destructiveness of that war was unimaginable. Ten million killed. No one could actually remember why it all started. One person got assassinated by some madman in Yugoslavia or somewhere, and then 10 million humans killed each other. I don’t know whether to laugh or to weep. It’s tragic. Already, in that war, we can see the destructiveness of the egoic consciousness with advanced technology. Humans were totally horrified: “What have we done?” But, of course, it continued. Soon, the next world war came with mass exterminations and so on. That is why it has to change now. If we don’t change, if the egoic consciousness continues, I don’t believe that humanity as a species can survive, or at least human civilization can survive, for another hundred years. It is quite possible even that the planet would no longer be able to sustain human life. Probably, the planet eventually would regenerate and produce some other life form. Consciousness would flow into some other life form and express itself through that, whatever that would be. So, in the end, it’s all fine, no matter what happens. But I believe from what I can see there is a good chance the shift will happen in humanity before it is too late. Ray: You are a German and lived your first formative 13 or so years in Germany. Germany, of course, perpetrated one of history’s most terrible acts of egoic madness: the Holocaust. How has that impacted the evolution of the German nation and people? Eckhart: Germany is a nation that created an enormous amount of suffering on the planet. The German people also themselves have suffered, because it always goes together. The more suffering you create, the more suffering comes to you. Perhaps they are evolving quickly now because of it. In Germany, there was complete identification with the collective — the nation and so on — and now all that has gone away completely. Since the Second World War, the German people have disidentified from identification with their nation, because the nation was recognized as insane. It was so apparent. So, Germans now have far less identification with their own nation than, for example, Americans have. Some disidentification with the collective, as I call it — us and them — started to appear slowly in the States during the Vietnam War, when millions of people suddenly saw, “This is insane.” Many people actually left. Huge numbers of young men who did not want to be part of the madness came to live in Canada. In the 1950s, most Americans were very conformist. Then, in the ’60s, something happened: a disidentification. Now, we may have another stage: again, many people are seeing the madness of it clearly, and there is a further disidentification. But the disidentification has been much more complete in Germany and probably Japan after the Second World War, because those countries were the places where the egoic madness came through most strongly. The fact that they were highly cultured, highly evolved countries didn’t help, because the ego also was highly evolved. In both countries, the ego in every human being was very highly evolved, and that is one of the reasons why such acts of madness were perpetrated by those two countries, which in turn is why they disidentified from identification with the collective after the Second World War. Ray: Eckhart, how can groups come to reflect enlightened consciousness without ego? By definition a group is brought together by a sense of identity and therefore by a shared egoic understanding and agreement. Eckhart: Enlightened groups can exist, as long as the individuals’ sense of identity is not derived from a mentally defined image of us. Every individual is in touch with the deeper level of being, the aware consciousness. If these humans form groups, they do not derive their sense of self from the group, which does not mean there cannot be a sense of being part of this group. But the group itself does not become an egoic entity. Otherwise, if the individuals who make up a group have personal egos, and their identities lie in these egos, then their egoic identities will shift to the group. It might look as if they are losing their personal egos, but the ego simply shifts to the group. This happens in sects, in political parties, in religions, and so on, if you derive your sense of self from them. Also, a group needs enemies, because without enemies its identity cannot continue to be defined. But there can be other associations — enlightened businesses, for example — that do not work on the basis of us against them or wanting profit as the main motivating force behind what they do. So, yes, there can be enlightened groups of people. They enjoy being together, and they form a kind of collective entity, but not an egoic collective entity. The group does not need enemies. Consciousness very much can come through these groups. This happens sometimes when I do retreats. People come together — let’s say 200 or 300 people, 400 or 500 people — and they join me for a few days for a retreat. There is a temporary sense of a group, a sense of belonging. But these groups are not egoic entities. These are groups through which consciousness can come through. The group becomes almost like a vortex for the arising of the new consciousness, and it is very beautiful. You do not need the group. You can join a group and then step out again if you have to. Even giving a talk for two hours to a small audience, there is a temporary energy field there that is the group. It’s not egoic, and it can be very helpful. In fact, the collective energy field of presence can be very helpful when people come together. It can give you an enormous boost. The arising consciousness comes through very strongly. So, that is all to the good. Ray: In A New Earth, you write that some religions may have generated originally from an awakened consciousness, and then the egoic part creeped in. Eckhart: Yes, that can happen. Ray: I wonder for individuals, then: When you awaken, does the ego always lie in the background, ready to creep back in unless you maintain your awareness? In your own life, Eckhart — in your personal partnership, business relationships, or daily interactions — does the ego sometimes rise up a bit? Eckhart: The ego potentially always can be there, because it is no more than a collective mind pattern. I have seen cases where people seemed to become totally free of ego, and at some point in their lives the ego came back. It has happened, for example, to some spiritual teachers. At some point in their lives, they began to identify again with form. Vigilance in oneself is very important. Vigilance means to be alert to what happens inside, so you can catch an old, collective habit pattern. For spiritual teachers, it is important not to identify with the image people inevitably have of them. People always form images of who others are, and they can be inflated images. People may not realize that the enormous energy and spiritual power that comes through a teacher, especially in a teaching situation, has nothing to do with that person. Ray: How do you explain that to someone convincingly? Eckhart: I sometimes say to people, “I am a window frame — no more. The window frame is not that important. What is important is the light that comes through the window. If you confuse the two, you elevate the spiritual teacher into some special being. Form comes back here. You equate the light with the form of the teacher, the person of the teacher. Then you project the image that has been created — and many do it together in a group — you project its specialness onto that human being. In some cases, people even believe that this or that human being is divine. And that implies, of course, that the others are not! Or, “He is the only one” — this is another good one — “He is the only one on the planet right now.” These are all indications that you have been led astray, because you equate the formless spirit with form. That is the challenge of a spiritual teacher: not to take on board the projections of specialness people have. This is especially dangerous for spiritual teachers who only have contact with disciples or followers, who may live in an ashram. The teachers continuously are bombarded with projections of specialness. After a few years, they succumb. They buy into it. And the ego returns in that way. Ray Hemachandra: How has your relationship to God, and perspective about God, changed and matured as you’ve entered midlife and faced midlife issues? Marianne Williamson: I don’t think it’s changed, but the more mature we are, the more receptive we are. It’s like every year you go to the same Easter service, or every year you go to the same Passover seder. The story of Easter doesn’t change, and the story of the Passover doesn’t change, but you go year after year because you change. If you allow yourself to deepen with midlife, your experience of everything deepens, including your experience of God. The same truths that you understood and that affected you last year, you can receive at a deeper level this year because you’ve experienced more life. That’s how it has been for me: The religious stories, the religious truths, the spiritual principles — obviously, they don’t change. But as you get older and you experience more, you recognize the applicability, the profundity, and the fundamental truths of spiritual principles in ways that you couldn’t when you simply were living a less dimensional life. Ray: Has it gotten any easier? Or do you still grapple with spiritual understandings? Marianne: I don’t think of spiritual principle as a struggle. I think of life lived without spiritual principles as a struggle. As you get older, life gets harder if you’re not applying spiritual truths. Also, as you get older, you have more and more layers of experience to forgive, more layers of heartbreak, more layers of what you might think of as failure. Once you get to your forties or fifties in this society, very few people haven’t had at least one body blow — financial, bankruptcy, divorce, relationship disaster, addiction, trouble with a child, trouble with a parent. Most people take some blow. So, living in this world, under the dominance of the ego mind, is difficult. That’s the struggle. But the point of life is not who falls down. The point is who gets up and how you do it. To me, that’s the important issue about spiritual principle: that you recognize it as both that which saves you from the self-sabotaging mind and that which heals you and lifts you up when you succumb to it and attract whatever personal disaster you attract. Ray: You call midlife “the age of miracles.” Does realizing the miracles require conscious choice? Marianne: A miracle is a shift in perception. If you allow your perceptions to be dominated by a status-quo perspective — you hold thought forms like: over the hill, too old, he or she won’t want me anymore, they won’t hire me anymore, I blew it and it’s too late for me now — these thought forms create a network of status-quo mental habit patterns. The miracle is when you shift. The miracle is when you know there is no hill — you’re removing the hill. The miracle is when you realize the time of physical decline can be a time of spiritual incline. King Solomon said his youth was the time of his winter, and his more mature years were the time of his summer. When you understand the law of divine compensation, you realize that in the presence of spiritual consciousness, there is more than enough compensation for any diminishment in materiality. So, the miracle is that you consciously change your thinking. You realize that, as it says in A Course in Miracles, if you identify more with your spirit than with your body, then you are living in a zone of eternal renewal — an infinite wellspring of new beginnings and breakthroughs that are limited by nothing, and certainly not by the fact that you are older than you used to be. When you realize that the real breakthroughs come from levels of higher consciousness, then you also realize that the achievement of maturity and wisdom is the most powerful generator of new beginnings possible. Ray: Are these realizations any different for the generation in midlife today from previous ones? Marianne: I don’t know if they’re different. I’m not a member of a previous generation, so I can’t really say what it was for them. But I do think that every generation has its unique story. Our story has to do, among other things, with the fact that we experienced a prolonged post-adolescence. For many reasons, we failed to get on with it the way our parents had. I think every soul longs to get it right before they die. It’s a craving of the soul to feel that on some level you at least tried to do what you came here to do, because the soul has that sense of what it came here to do. As it says in the Jewish book of prayer, nobody wants to die feeling that they have not sung their song. For the Baby Boomer generation — those of us raised in the ’60s — there was a special mark on our foreheads. We were the generation that was going to make things better. We were going to make things right. And, again, there’s a collective shame and horror, if we’re honest with ourselves, in facing the fact that under our watch — the watch of this generation that was so committed to making things right — things have gotten so much worse. We were the generation that was going to replace guns with flowers. And, in the end, no generation before ours has ever replaced so many flowers with guns. That realization increases our sense of urgency. The big revolving door is coming back around for us one last time in terms of major chapter. You get to a certain age, and you don’t have time for any more five-year detours — relationship aftermaths when you realize, “Oh, that was a five-year detour,” or times when you look back and think, “That decade was stupid.” We have no time for that now. That’s a good thing, in a way, because there’s the sense that this is it. You’ve learned what your weaknesses are. You’ve learned what your strengths are. You’ve learned from your failures as well as your successes, and there’s the sense that, okay, if you’re ever going to be able to do it, it’s now. Ray: Do you mourn those lost generational opportunities, Marianne? And do you have to leave behind the regrets to move on? Marianne: I don’t think that anyone can age in a conscious way and not experience grief. You’re not to wallow, but if you don’t process your regrets, then they remain emotional underground toxins. If you did something in 1975 that you deeply regret and that you now can recognize as having been profoundly irresponsible, for example, the only way to be lifted out of deep regret and the pain over it is through atonement — through the kind of remorse that leads to genuine atonement, the making of amends, and forgiveness of self and others. You can’t remove that layer of pain by just saying, “Okay, I’m not going to wallow in it.” The only way to remove that layer of pain is to face what it says and to recognize it as the look in the mirror that it is, reflecting the things you did that you wish you hadn’t done and the things you didn’t do that you wish you had done. What we really need to avoid is this epidemic of false positivism and false happiness, which says if it hurts, it must be bad. Sometimes it hurts because you have a conscience. You have healthy shame. So, at a certain point, you can’t help but go back. You wake up one night, and you just can’t stop thinking about something that happened in 1989. There’s a reason for that. The monster comes out of the cave late at night, and the only way to slay the monster is to deal with him, and that will include forgiveness of self and others. It’s the internal work that’s absolutely necessary to guarantee the revitalization process. It’s like laboring a child: It’s not easy. Laboring the new self, which is this gigantic force whereby you ultimately claim your real possibility for this lifetime — no, it’s never easy. But the alternative is far more difficult, because it’s just a very slow cruise to death. What are the two most important days in your life? “The day you are born and the day you find out why,” Mark Twain famously wrote. DR. SANJIV CHOPRA is Professor of Medicine at Harvard Medical School. He is also a bestselling author and sought after motivational speaker. He lives in Boston. GINA VILD is the associate dean and chief communications officer for the Office of Communications and External Relations at Harvard Medical School. She lives in Boston. Happiness is a fickle thing. Sometimes it sneaks up out of nowhere and other times you spend days tracking it down. But finding happiness is not totally out of your control. Dr. Sanjiv Chopra, professor of medicine at Harvard, shares four ways to be happy. Watch the interview below to learn how! Why am I suffering? Why do we suffer so much in life? This video will change the way you think about suffering and after watching this video you’ll probably stop complaining about your pain and suffering! Simple and life changing advice from the great enlightened saint Sri Anandamayi Ma. J. Krishnamurti – What Is Common Among All of Us? The author of the New York Times bestseller You Are the Placebo, as well as Breaking the Habit of Being Yourself and Evolve Your Brain, draws on research conducted at his advanced workshops since 2012 to explore how common people are doing the uncommon to transform themselves and their lives. 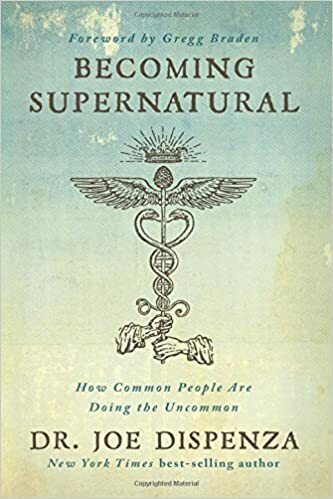 Becoming Supernatural marries some of the most profound scientific information with ancient wisdom to show how people like you and me can experience a more mystical life. Using tools and disciplines ranging from cutting-edge physics to practical exercises such as a walking meditation, Dr. Joe offers nothing less than a program for stepping outside our physical reality and into the quantum field of infinite possibilities. Dr. Joe Dispenza first caught the public’s eye as one of the scientists featured in the award-winning film What the BLEEP Do We Know!? 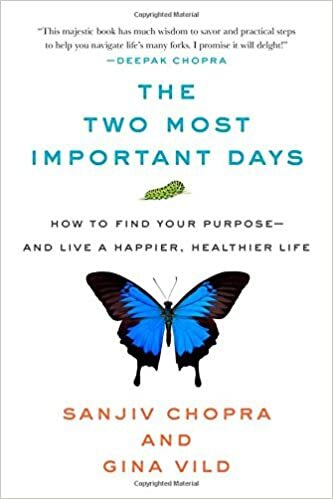 Since then, his work has expanded in several key directions that reflect his passion for exploring how people can use findings from neuroscience and quantum physics not only to heal illness but also to enjoy a more fulfilled and happy life. Dr. Joe is driven by the conviction that each one of us has the potential for greatness and unlimited abilities. If you’ve ever wanted to do more, feel better, and attract the uncommon into your life, then do we have the Becoming Supernatural show for you. Today I’ll be speaking with Dr. Joe Dispenza, the best selling author of numerous books including You Are the Placebo: Making Your Mind Matter, and his latest must-read for changing your life, Becoming Supernatural: How Common People Are Doing the Uncommon. It helped push me through hard times.. and I wish to pay it forward.. I hope this reaches someone in need.